Cookies are text files that contain small amounts of information that are downloaded to your computer or mobile device when you visit a website. Cookies are sent back to the original website at each subsequent visit, or to another website that recognizes them. Cookies are useful because they allow a website to recognize the user's device. Cookies can perform different functions such as allowing browsing between the pages efficiently, remembering their preferences, and in general improving the user's navigation. Regarding the types of cookies, these are classified according to the entity that manages them; thus, we have our own and those of third, according to the term that remain activated session or persistent, according to their purpose, techniques, personalization, analysis, advertising and behavioral advertising. They are those that are installed in a Web Portal, but are not owned by the portal that is being visited. Therefore, these cookies are specific to a third party's domain, and consequently, the information contained can be seen and managed by it. In the same way, this type of cookies can be used to show ads adapted to your own interests. If the user clicks on a banner, it will be referred to the corresponding URL of the advertiser, in which case cookies will be used to perfect information about their own preferences. All these processing tasks will be regulated according to the legal norms and all your data protection rights will be respected according to the current regulation. The user can freely decide about the implementation or not on their hard drive of our cookies, as well as their removal, following the procedure established in the help section of your browser. The User can also configure his browser to accept or reject by default all the cookies or to receive a warning on the screen of the reception of each cookie and to decide at that moment his implantation or not on his hard disk. The fact that the User configures his browser to reject all cookies or expressly our cookies may mean that it is not possible to access some of the services and that his experience on our website may be less satisfactory. 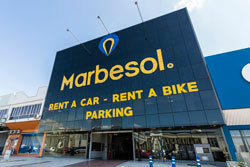 Motorbike rental Malaga, Motorbike rental service in Málaga and Costa del Sol.